The other meta-bill that defines the legacy of President Barack Obama besides the Patient Protection and Affordable Care Act is the Wall Street Reform and Consumer Protection Act that created that unchained monster called the Consumer Financial Protection Bureau. 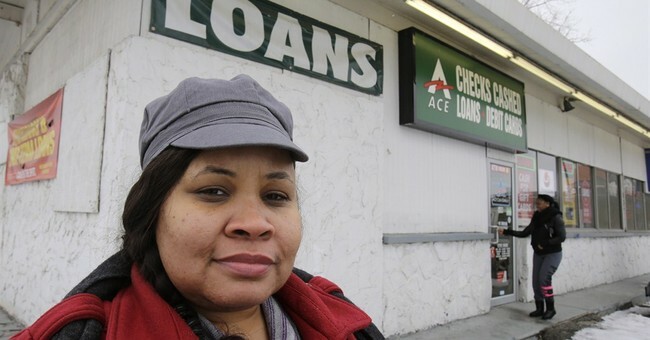 In the last week of March, this monster decided to go after to go after payday lenders, which makes sense for its purposes—as those rules are about to go live, it should scare the rest of us. For fans of the TV show “Scandal,” CFPB is like B6-13, the super-secret intelligence agency, isolated from oversight from Congress or the White House, which controls everything. This alienation from democratic forces the bureau resides inside the Federal Reserve, but without oversight from the Federal Reserve. The CFPB was designed by two corrupt Washington operatives, former Massachusetts congressman and rent-boy fixer Barney Frank and former Connecticut senator Christoper J. Dodd, who received sweetheart mortgages from the notorious Countrywide Financial. Dodd-Frank, the common name for the bill, sought to undo the liberation of the financial markets begun by President Ronald Reagan, a point made clear by Obama when he signed the bill into law at Washington's Reagan Federal Building. Although the bureau has powers wide and deep, CFPB Director Richard Cordray is careful to pick his targets. Not only are Wall Street firms lawyered-up and ready to hit back, but other regulators, such as the Securities and Exchange Commission, the Federal Deposit Insurance Corporation and the Federal Trade Commission, are keen to keep the CFPB out of their regulatory fiefdoms. Payday lenders seem like a villain sent over from Central Casting. They operate on the fringes of our banking system and they are further burdened by a stigma that means any satisfied customer is keeping his mouth shut. In its proposed rules, CFPB has constructed a regulatory regime that will put the traditional payday lenders out of business with caps on interest and restrictions on how many payday loans a customer can take. If the new rules go solid, the typical payday borrower would be restricted to two payday loans per 12-month period, while the typical payday borrower takes out 10 loans per year. Written into Dodd-Frank was the acknowledgment that J.P. Morgan-Chase was not going to flip the unbankable $200 until payday, when the law even had specific language stating that no provision of the law shall be construed as conferring authority on CFPB to limit interest rates. But, what do words mean anymore, anyway? Soon after the new rules were proposed, President Barack Obama said he fully supported the bureau's going after the small dollar credit industry. Whoa. $500 becomes $1,000? Well, yes and no. Yes, if you do not pay back the loan when you promised to pay it back. No, if you pay back your loan, avoiding compounded your debt interest and the inevitable late fees to cover the administrative costs of hunting you down. There are 70 million Americans for whom the banking system might as well be in another country or another planet. Without the option of short-term lenders, most regulated by the states in which they reside, the only answer left to them is the black market. Either finding a loan shark or worse, performing illegal tasks than create criminal and moral jeopardy. The CFPB has been boxed out of regulating the big game, so its current attempt is take on the stigmatized payday loan industry. The regulators at the bureau smell an easy win. Congress needs to tell them to pick on someone their own size.